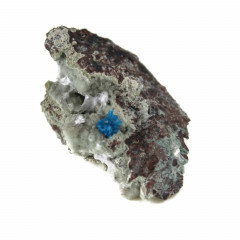 Cavansite is a fairly rare blue mineral, found only in a few pieces worldwide. Our specimens are available in a couple of different sizes. A rare and gorgeous blue mineral, which is only found in a few places worldwide. Most of the specimens available on the market come from India – specifically Pune and the Deccan Traps. As it is relatively rare and has a strong and interesting colour, this lovely blue mineral is quite a popular collectors item. It is often found on a Stibnite or Calcite matrix. The name Cavansite comes from the chemical composition of the mineral, which contains calcium vanadium silicate (Ca-V-Si). This mineral may be connected to the throat, third eye, and heart chakras. Some people believe that this mineral helps to clarify your inner self, and can be used to further understanding of inner truths and wisdom. It may also help you to accept yourself for who you are.